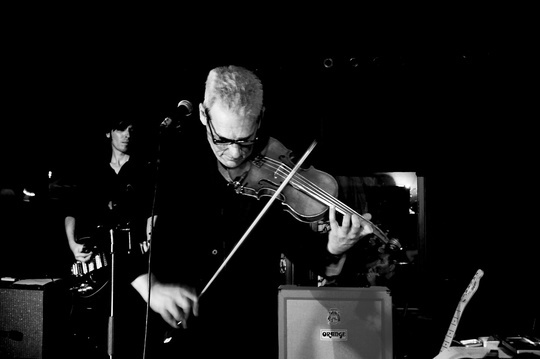 Mitbegründer der Avantgarde New Wave Kultband Tuxedomoon aus San Francisco Blaine L. Reininger, co-founder of the legendary post punk band, Tuxedomoon, comes to Germany in support of his new album “The Blue Sleep” released by Les Disques du Crepuscule. These shows find Reininger in fine form, moving from keyboards to guitar for the bulk of his classic numbers, including many from his seminal 1985 album “Night Air” and a selection from his large solo discography 1984-2015, including several Tuxedomoon standbys. (Yes, he plays “No Tears”). As ever, his virtuoso violin playing is featured, on such songs as “Volo Vivace”, tracks from “The Blue Sleep” and a collection of new extracts from his catalogue of music for film, dance, and theatre. Reininger's voice is as it ever was, and he has achieved a maturity of expression and phrasing that has served him well. He is joined for this tour by noted Greek guitarist and composer, Tilemachos Mousas, with whom he has played on and off since 2007.